“I am writing this letter of commendation to WA’s Cockburn Hearth House to applaud Dylan, one of your salesmen, for the lovely way he communicated with me on the phone and when I came to your shop to buy a new gas fire. He could not have been more helpful. On Friday July 18, after my gas fire died the night before, I’d called Hearth House while driving to my home, to inquire about the possibility of buying a new gas fire. “Just a quick note to say THANK YOU to you all for the fabulous service we have received. From the initial phone call with you right through to the install of our replacement air conditioning unit you guys have been a pleasure to deal with. Your accounts department were friendly and helpful and the installers yesterday kept me updated as they had been delayed at another job. Everything is working perfectly. “From sales to install, absolute perfection. Great service, great deal, great product”. “I just wanted to drop you a quick note to say how much we appreciated all your time and effort in helping us with our new heater installation. 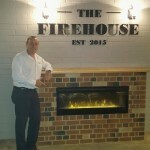 “Hearth House has recently installed a Dimplex Synergy electric fire at the new Firehouse Bar at the Gemmill Homes headquarters. Gemmill Homes is a leading home builder in Perth and Hearth House has enjoyed a great partnership with Gemmill Home both for heating and also air-conditioning. The Fireplace Bar opens up onto their pre-start product display area, so the heater will get a lot of attention from clients selecting the fittings for their new Gemmill Home. “Thank you very much for the people you sent today. I cannot speak highly enough about their politeness, positiveness, demeanor, work ethics and can-do attitudes to everything. They were obliging and impressive in all aspects, and worked to overcome all the challenges they came across with this difficult install. They went above and beyond in a few aspects I noticed. Their work is of a very high quality, aesthetically pleasing and accurate. Their willingness and compulsion to do the right thing shone above all.